You can change the security rights of a user account to allow or deny access to certain areas and functions of Dentrix Ascend for that user by changing his or her user role. If your organization has multiple locations, a user can have a different role for each location. If your organization has one location, on the Basic Info tab, select a different Role for the user. 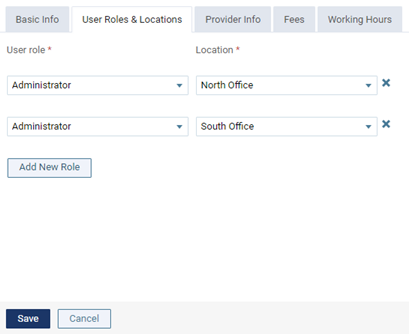 If your organization has multiple locations, to change rights to a location, on the User Roles & Locations tab, select a different User role for a selected Location. A user can have only one role assigned for each location. 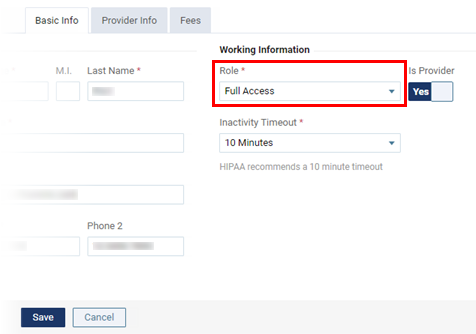 If your organization has multiple locations, to add rights to a location, click (or tap) Add New Role, and then select a user role and a location (only unassigned locations are available for selection). A user can have only one role assigned for each location. The next time the user logs in to Dentrix Ascend, he or she will be able to access the selected location, according to the specified rights of the selected user role. After you modify the user account, the user will receive an email message, stating that changes were made to his or her user account. Also, if the user is logged in to Dentrix Ascend, the changes will not take effect until he or she logs out and back in again.